It’s been a while, but it’s that time again. It’s another book-report style take down of your favourite aspects of Egyptian Mythology. Today, considering the current storyline of Godslave, Library Friday is here to present the history and backstory for the solar falcon god, Horus. We’ll be covering his many epithets (in case you didn’t know, there’s a lot), how he came to be so popular, and the beginning of his relationship with Set. What we won’t be covering is the actual Conflict of Horus and Set. That story is too long and convoluted to append to here. More than likely, that’ll require it’s own post. The big reason this Library Friday is here is because I was able to afford the time to spend at the library compiling research and putting together this report. 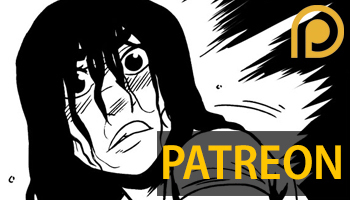 And that wouldn’t have been possible without the kindness of the Godslave patrons. Thank you so much for your support! It’s because of your kindness that I’m able to put freelance work aside and give Godslave and Library Friday the love it deserves. Horus (or Heru), as most people know him, is the son of Isis and Osiris. When people think of Egyptian Gods, these are the names that come to mind. They are, aside from maybe Ra, the most famous Egyptian Gods to survive history. The Osirian cult was popular and powerful in the ancient days, which not only meant that they were able to make their stories known across the walls of tombs and temples, it’s meant many other gods and cults were absorbed into their lore. 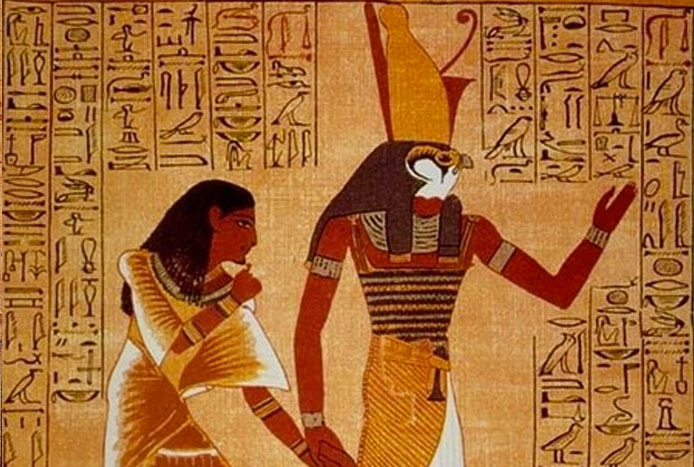 Horus didn’t start out in the Osirian family, though. Horus is actually one of the oldest gods that came out of the pre-dynastic cults. People who looked up to the sky marvelled at the falcons soaring above them. They began to think of the sky ‘as a divine falcon whose two eyes were the sun and moon.’(Egyptian Mythology, Guirand Felix) Whoever Horus’ original cult followers were, it’s thought that they must have been fairly powerful because wherever these worshippers settled, they brought the name of Horus with them. Being spread so far in so many different sanctuaries- is also thought to be part of the reason why Horus has 20 odd names. Horus Behdety, Haroeris, Harakhte, Harmakhis, Harsiesis, Horus Khenty En Maat, Horus Netcher Nedje Itef, Horus Khenty Khat- just to name a few. Understand that these are not different people- this is all still Horus; just different aspects of him. Each name is essentially a reason why he’s great, but also clearly detail his life growing up. It’s worth noting that trying to find detailed back stories for most Egyptian Gods is fairly difficult, because so much has been lost to time, absorbed and destroyed by the Osirian cult, and library burnings (thanks Coptics). But Horus’ story is accessible from beginning to end, because, again, he was so popular and it was written everywhere. Starting from birth, Horus has two epithets. Heru-pa-khered (Heru the child), and Heru-sa-Aset (Heru, son of Aset). Heru-sa-Aset becomes the most popular epithet, nearly eclipsing all other titles. Despite the standing of the Osirian family, Horus is born prematurely in the North East Delta swamps in Khemmis. His mother, Isis, is on the run from Set and his followers. Horus is weak and vulnerable, dependant on Isis for protection. This relationship and aspect of Horus is great for mothers praying for healthy children, or a blessed and protected birth. It’s also in this time that Horus has his first run-in with his uncle, Set. With no one to help her on Earth, Isis throws her hands up and pleads to the gods. In the sky, Ra’s boat, the ‘Barque of Millions of Years’ hears her cries. The boat stops so that Thoth may descend and help Isis. If the gravity of that action is not clear, know that the Egyptians believed the Barque of Millions of Years was the sun. So it is not that they stopped their boat- they have stopped the sun- which means stopping the day- which means stopping the Cycle. The universe is literally at a stand still so that Horus may be saved from death. The reason worshippers of Horus and the Osirian family told this story was because Horus had come to represent the Pharaoh in stories. He is the true king, trying to regain his rightful throne and rule his people. Therefore, telling a story about how Ra is supremely concerned for the sake of Horus- is how they told people that Ra is supremely concerned with the sake of the Pharaoh. They go so far as to even say Horus is the ‘son’ of Ra, therefore the Pharaoh is descended from the solar gods. To tell this story would also be a message to people that if something terrible were to befall the Pharaoh, the universe would collapse. Beyond that, other titles were often given to Horus because of his major victories over Set and for Ra. When he earned the title of Horus Behdety ( before Harakhte, after Haroeris), it was for both. You might not know the district of Behdet, but it you’re somewhat familiar with Egyptian Mythology, you may know Edfu. Edfu being Horus’ cultural worship centre. Somewhere in-between Set and Horus making passes for the throne, Ra was the ruling king over the united lands of Upper and Lower Egypt. But while his army was away in Nubia, Ra learned of a group plotting against him led by Set. 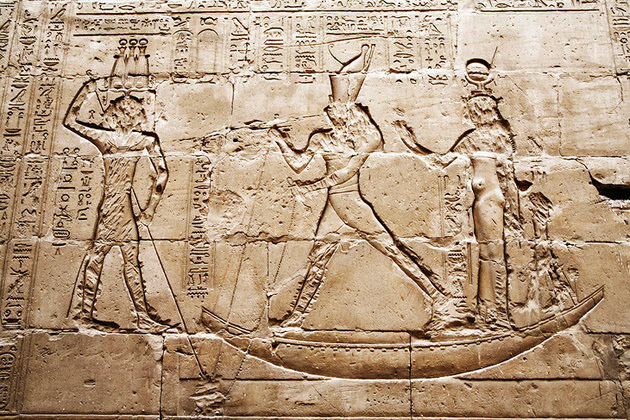 By his boat, Ra landed at Edfu and asked for Horus’ aid to vanquish his enemies. 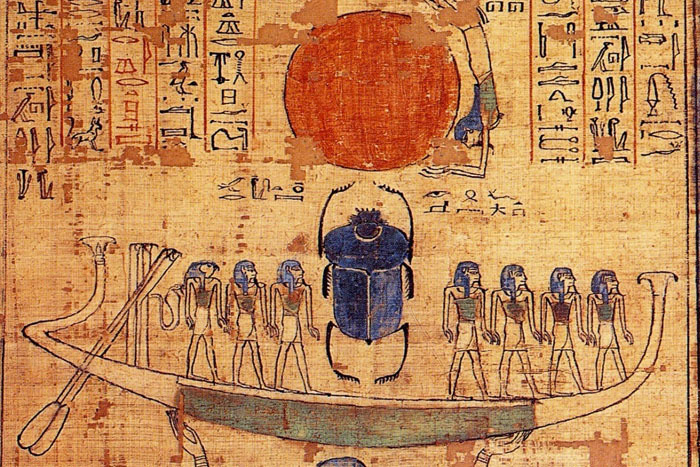 Horus took to the sky in the form of a winged sun-disk(the ultimate symbol of Behdety) and spotted the enemies making their way to attack Ra. He drove them away with his aerial attack, and they fled in fear. Thinking the enemy defeated, Horus returned and Ra gave him the title ‘Horus Behdety’ (or Horus of Edfu). The story goes on though. Despite his defeat by Horus, Set has his people change into crocodiles and hippos and attack Ra’s boat directly. But Horus’ followers, the ‘blacksmiths’( Sacred Texts, http://www.sacred-texts.com/egy/leg/leg07.htm) harpoon the creatures from the boat. Horus transforms himself once again into the winged sun-disk, sets himself up on the prow of the boat, and pursues the survivors. At one point even beheads Set and drags the body by the feet through Egypt. The fighting continues on and takes them through Lower Egypt to nearly the borders of Asia. Horus squelches the rebellion and emerges victorious, and in this honour Ra decides that every temple and shrine- no matter the god- will have the emblem of a winged sun-disk as a protective ward. All of the stories of Horus’ great victories go something like that. They make him look amazing, usually showing how close he is with Ra, and humiliate Set. It makes sense when you consider that 1) Horus is meant to represent the Pharaoh, and the Pharaoh needs to be akin to a god to his people while he rules, and there’s no better way than getting Ra’s approval, and 2) how popular and powerful the Osirian cult was. As soon as Horus was brought into the Osirian family, his position was sealed within history as part of the most famous triad in Egyptian Mythology. As was Set’s role as Osiris’ murderer. There’s also Harakhte / Harmakhis / Harmakhet. This translates to ‘Horus of the Horizon’ and he takes this name when personifying the rising sun. This aspect of Horus and Ra was, like the sun, a symbol of resurrection. Sharing the roles of royal, solar deities led to the two eventually merging as Ra-Harakhte. Harakhte is represented some times as a lion with a falcon head, a lion with a ram head- but most famously as the 60 foot tall, 80 foot long Spinx of Giza. The Sphinx’s face was modelled after the pharaoh of the Fourth Dynasty, Khepren. 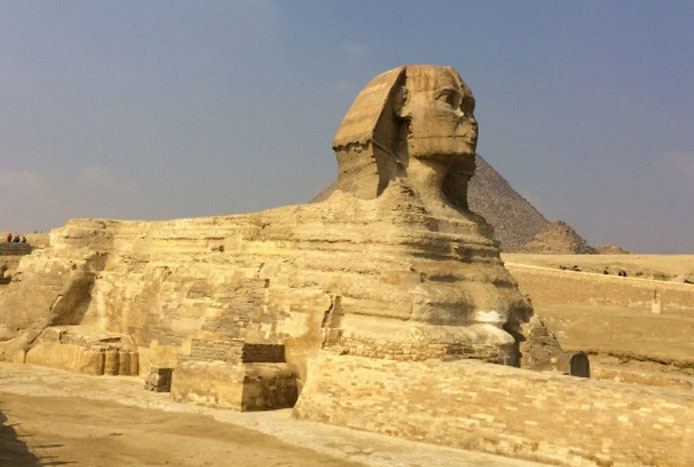 This is also the Sphinx that makes an appearance in the story of Pharaoh Thutmosis III. 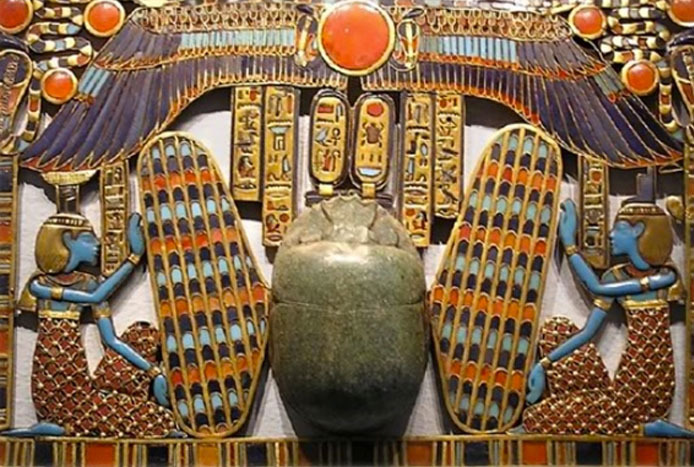 Other titles include Horus Khenty Khat which is thought to mean ‘Horus as the head of the belly.’(Who’s Who in Egyptian Mythology, Anthony S. Mercatante). In this form he has the head of a crocodile with a human body, and an Atef crown with the horns of Khnemu. There’s Horus Netcher Nedje Itef, Horus the god, he who avenges his father. This is the name he takes when he defeats Set, his father’s murderer. Horus, The Hebenuite, Hebenuite was a city in Upper Egypt, and in this role he’s represented with a hawk head on a man’s body, riding an antelope. This makes more sense when you understand that antelopes were one of the animals sacred to Set, so this is another portrayal of Horus’ victory over him. Horus- Aah was the gods Horus and the moon god Aah combined. Horus Khenty En Maatyu, Horus as the head of those who see not- colloquially known as the Blind Horus. This is the Horus represented when Set blinded him in battle. He’s shown as a shrew mouse in this form. A fun aside: because Horus’ left eye was believed to be the moon, worshippers used the story of Set tearing out Horus’ left eye as an explanation for why the moon appeared in different phases. There are a bunch more titles that could be included here, but I think you get the idea: Horus was precious to the Egyptian people, to their royalty and to their religious cults. They made that as clear as possible by spreading his stories, his symbols and his legacy far past Osirian reach. To stand against Horus- would be to stand against Egypt- and to the people it’d be as if standing against the very universe and its cycle. But let’s get to that conflict next month. 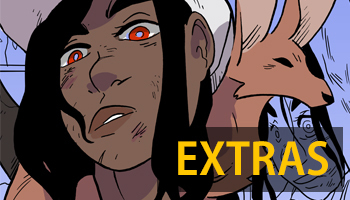 Thank you again to the wonderful Godslave Patrons that made this post possible! If you're interested in becoming a Godslave Patron, it's only 2 dollars a month and you have access to a couple years of Godslave conceptual work, peeks into my freelance and personal projects and more! Visit the link HERE for more information!